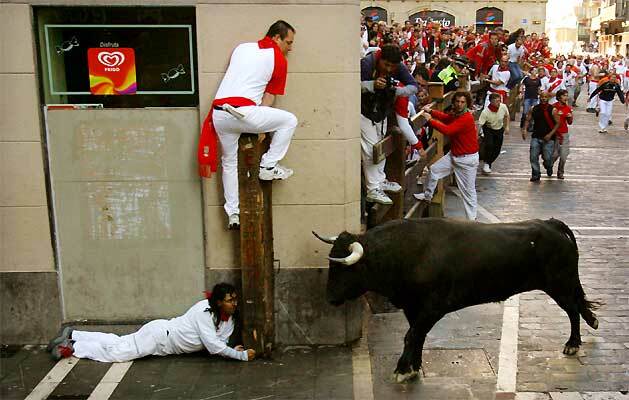 Pamplona Bull Run (or Encierro) is a festival held in Pamplona (Spain) every year from July 6-14 during the Fiesta de San Fermin. 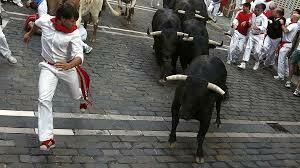 It involves running in front of a small group of bulls that have been let loose in a sectioned-off part of the town's streets. Most runners dress in the traditional clothing of the festival which consists of a white shirt and trousers with a red waistband and neckerchief. Also some of them hold the day's newspaper rolled to draw the bulls' attention from them if necessary.